Amanda Blough’s fourth-grade students at Corpus Christi School completed a unit on weather and the water cycle. The class talked about water, how it affects weather, and how it is recycled. As a NASA Explorer Schools teacher, Amanda was able to add several additional resources to this unit after attending the NES summer recognition opportunity “Water Filtration” at NASA’s Marshall Space Flight Center in Huntsville, Ala. By searching NASA Educators Online Network, or NEON, she found a recommendation for a NASA e-Clips video about how water is recycled on the International Space Station. The video shows students how much water people consume on Earth per day compared to how much water astronauts use on the space station per day. Her students did the NASA Engineering Design Challenge: Water Filtration Challenge to see what it takes to filter water to make it clean again. Blough showed pictures of the Environmental Control and Life Support System at Marshall and explained how it works. To cap off the lesson, Blough took her students for a tour of the local water treatment plant so they could see firsthand how their city cleans the water they use in their homes. Eight NASA Explorer Schools educators attended the Solar System Inside and Out research experience at the Space Telescope Science Institute in Baltimore, Md., during July 2011. The workshop prepared the attendees to implement a variety of activities introduced during their research experience. Cris Dewolf, an NES educator from Michigan, took the experience a step further and shared the LED “secret message” activity at a workshop at Yerkes Observatory and at the Michigan Earth Science Teachers Association Fall Conference. To become eligible for one of these NASA Explorer Schools research experiences, be sure to complete the surveys associated with resources you are using on the Virtual Campus! After attending the NASA Explorer Schools Goldstone Apple Valley Radio Telescope Summer Experience, educators Kaci Hines, Cheryl May, Nancy Guillory and Donna Rand created a lesson that allows their students to control the GAVRT telescope from their classroom. Their lesson challenges students to determine the temperature of Jupiter by using the telescope. Three major tasks are involved in manipulating the telescope and acquiring accurate data: calibrating, scanning and recording data. Their lesson divides students into three separate groups to let each group learn the different tasks required to operate the telescope. For more information and images, go to the NES GAVRT event page in Facebook or the GAVRT article in NEON. Link to the NES Virtual Campus homepage. 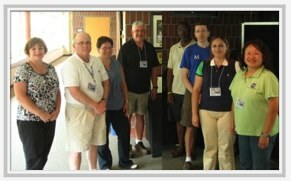 During the week of July 18, 2011, eight NASA Explorer Schools educators from across the country attended the Solar System Inside and Out research experience at the Space Telescope Science Institute in Baltimore, Md. Although these educators thoroughly enjoyed this experience, their students are the real winners because of the engaging NASA lessons being brought back to their classrooms. To see photos and information showcasing NASA’s the Solar System Inside and Out, visit the facebook event page. To earn a chance to participate in an event like this next summer, sign up to participate in the NASA Explorer Schools project. Link to the NES Virtual Campus participant’s home page. Ten NASA Explorer Schools educators participated in the project’s Water Filtration Research Summer Opportunity at NASA’s Marshall Space Flight Center in Huntsville, Ala. The workshop took place from July 20-22, 2011. During the exciting three-day research experience, the educators learned how water is recycled in nature, in city systems and on the International Space Station. The group toured Marshall and participated in hands-on activities that they can incorporate into their curriculum in the 2011-2012 school year. 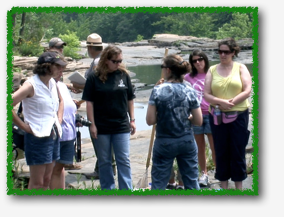 In addition, the educators traveled to Little River Canyon National Preserve where they met with a limnologist from Jacksonville State University. While at the National Preserve, they analyzed the water in the canyon stream. To see videos and images from the NES Water Filtration Research Opportunity, visit the event page in facebook. From July 18-22, 2011, 12 NASA Explorer Schools educators participated in the NES Goldstone Apple Valley Project located at the Lewis Center in Apple Valley, Calif.
During the five-day research experience, teachers became familiar with the use of the Goldstone Apple Valley Radio Telescope, or GAVRT. This was an exciting venture designed to provide hands-on scientific discovery in America’s classrooms. 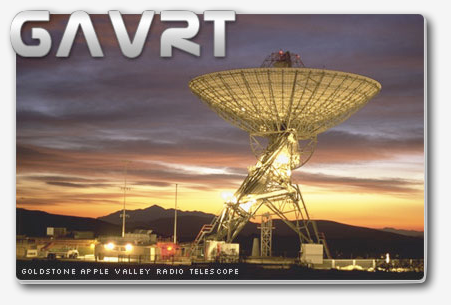 The GAVRT project uses a series of dedicated 34-meter (110-foot) radio telescopes at NASA’s Deep Space Network Goldstone Complex connected to classrooms via the Internet. The five-day opportunity provided teachers with the curricular, operational and scientific knowledge to implement GAVRT within the framework of their classroom. Participants learned how to use special software during the workshop giving them access to the telescope for student use during the school year. 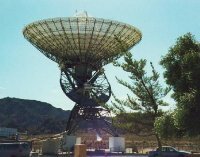 Students point the massive dishes — located in California’s Mojave Desert — at targets in space and record their findings. With each pass of a planet or quasar, students join the ancient family of explorers who have gazed into the night sky since the beginning of time to understand their place in the universe. To see videos and pictures from the NES GAVRT Project, go to the event page in facebook. 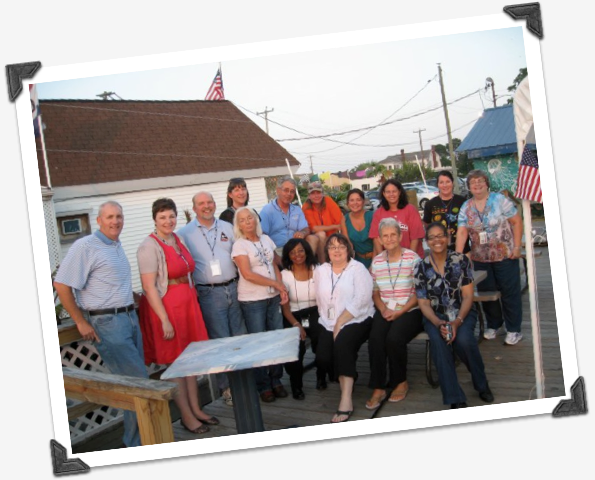 From July 11-15, 2011, fourteen highly enthusiastic educators participated in the NES Coastal Observation Research Experience at NASA’s Wallops Flight Facility, located at Wallops Island, Virginia. During the five-day research experience, teachers became familiar with the science and research techniques used by NASA to study coastal oceans, ocean color and Earth’s biosphere from space. They also had an opportunity to board research vessels and perform some of the same research techniques while at sea as those used by NASA scientists. To read the participant’s blog and see videos and pictures from the NES Coastal Observation Research Experience, check out the experience’s Facebook event page.